A short time ago I went to get some lunch at the Palo Alto Mollie Stone’s, a supermarket that happens to draw many neighborhood Jews because they stock plenty of Jewish products (like challah bread, yahrzeit candles, and matzo meal), or perhaps they stock plenty of Jewish products because they draw many neighborhood Jews. Outside the supermarket, a Chabad Jew stood in his recognizable black suit and fedora with a lulav (a bundle of branches) and an etrog (citron). As I passed to enter the store he asked if I’m Jewish. So I stopped and told the Chabad guy, “Yes.” He reminded me it’s now the last day of Sukkot and asked whether I’d “waved the lulav” yet. Now, around the time of my bar mitzvah I was very involved with my religion, in large part because of the mentoring and encouragement of my rabbi, Rabbi Ungar, a real mensch. But not long after my bar mitzvah he moved across the country and we got a new rabbi who was a zero in the personality department, and my interest in the religious aspects of Judaism (as opposed to the cultural) waned. 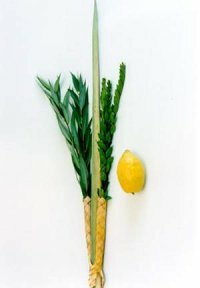 At any rate, even with my long-ago immersion in Judaism I had no recollection of what it meant to “wave the lulav.” I accepted the man’s invitation to step inside a makeshift sukkah where I donned a yarmulke, took hold of the lulav and etrog, repeated some blessings in Hebrew at his prompting, and waved the items right, left, foward, backward, and up and down (signifying God is everywhere). It felt good to perform the ritual. He asked whether I had a place to go for Simchat Torah, the joyous holiday that begins tonight when Sukkot ends. I declined his invitation to visit the local Chabad temple, since I live pretty far from Palo Alto, but when he urged me to find someplace near home to celebrate with other Jews I told him I would, and I meant it. That feeling lasted for about a minute after I thanked him and entered the store to forage for lunch. I realized that I had again fallen under the spell of tribalism, the powerful emotion that comes from being in a group where you feel like you belong (and where, crucially, there are others who don’t). This emotion — which is what makes cults, gangs, and wars work, among other things — blows right past the intellect and latches firmly onto the hindbrain, where only deeply ingrained habits of rational thought can dislodge it. During my visit to Israel in the 1990’s for the wedding of my friend Chuck, I was in the grip of tribalism for almost a whole week. No matter that I was in a very strange, very foreign place; the sensation of belonging was all-consuming. (It was that same warm feeling that got me out of bed on Saturday mornings to attend Shabbat services when I was 12 and 13.) I was certain I wanted nothing more to do with America and wanted instead to live in Israel. I talked this over with other American expatriates I met there, trying out different theories of what was making me feel that way: America’s short history vs. Israel’s long one (counting more than just the modern state of Israel, of course)? The sense of pioneering a young nation that pervades Israeli society? The stated need of a nation of my fellows for young people with skills like mine? Ah, but what makes them my fellows — a slightly closer genetic relationship than I have to most other people? A bit more common heritage? Why do those things matter? It doesn’t mean that any particular Israeli is more or less likely than any particular American, German, Russian, or Thai to be a jerk I’d rather avoid, or to be someone I’d like to pal around with. In fact doesn’t it enrich me more to surround myself with people who are less like me than more like me? Pingback: gee bobg » Blog Archive » Vincent Price in… Plea From The Saint! Next PostNext Vincent Price in… Plea From The Saint!